Editor's note: Many books have been written about the 1910 fire. Reprinted here are excerpts from what we believe are the five best books. These eyewitness accounts describe the terror experienced by those who fought the fire and lived to tell about it. Reading these accounts, it is easy to understand why an outraged citizenry subsequently demanded action from a Congress that had been reluctant to appropriate money to fight forest fires. Excerpts from an interview with a Mr. Swain, taken from The Big Burn: The Northwest's Great Forest Fire of 1910, by Don Miller and Stan Cohen, Pictorial Histories Publishing Co. Missoula, Montana, 1978. It took courage to start more fires with surrounding country already a sea of fire and the wind a veritable fury, but it was our only chance; so a line of men was stationed just a few feet apart, forming a letter "s", from the Morning to the Hunter mills, just a few feet in the rear of the buildings. At the signal each started a blaze. These fires united in less time than it takes to relate it, and traveled up the mountains, leaping, foarning, rippling over the brush and grass, then bursting into crimson towers as they passed over stately pines and fires. It was a most beautiful sight yet a most terrible one ... Midnight was as light as day. Excerpts from Joe Haim's account. Halm graduated from Washington State College in 1909, and worked as a surveyor on the Coeur d'Alene National Forest. In a 1938 radio interview, he was asked what had been the greatest handicap faced by those who battled the 1910 fire. "There were no trails or roads, and we had to go in 65 miles to get to the fire when we were first sent out," he recalled. "In those days one spent the first week trying to get to the fire. It took more time to get into the country than to put out a small blaze." He did not mention that he held his terrified 1910 crew at gunpoint to keep them from fleeing a fire they could not possibly outrun. The wind had risen to hurricane velocity. Fire was now all around us, banners of incandescent flames licked at the sky. Showers of large flaming branches were falling everywhere. The quiet of a few minutes before had become a horrible din. The hissing, roaring flames, the terrific crashing and rending of failing timber was deafening, terrifying. Men rushed back and forth trying to help. One giant, crazed with fear, broke and ran. I dashed after him. He came back, wild-eyed, crying, hysterical. The fire had closed in; the heat became intolerable. Men, who quenched their thirst from small streams, immediately became deathly sick. The clean, pure water running through miles of ashes had become a strong, alkaline solution, polluted by dead fish, killed by the lye. Thereafter we drank only spring water..
On Big Creek, thirty men lost their lives while others lay prone for hours in the chilling waters of a tiny stream, great forest giants falling around and across them. Here three men were crushed by a falling tree. One of these unfortunates was caught only by the foot. Men a few feet away heard his cries and prayers, but were powerless to assist He dug and fought to tear away, but the thing which he had come to save held him fast until coma and finally death relieved his sufferings. On Seltzer Creek the ghastly human toll was twenty?nine. An entire crew was annihilated. The men fell as they ran before the merciless fire. "A candle flame to a mosquito"
"A continuous stream of fire"
Excerpts from W. G. Weigle's report concerning the deaths of 18 members of Lee Hollingshead's crew on the West Fork of the Big Creek of the St. Joe River. Panic?stricken, they fled into Henry Dittman's cabin, where they perished when the cabin exploded in flames. The rest of Hollingshead's sixty?man crew worked its way to safety in a burned over area. Excerpts from Ranger Edward Pulaski's accounting of the fire on Placer Creek near Wallace, Idaho. Pulaski was a Ranger on the Coeur d'Alene National Forest in 1910. His personnel file included this evaluation, written by his boss, Forest Supervisor, W. G. Weigle: "Mr. Pulaski is a man of most excellent judgement; conservative, thoroughly acquainted with the region, having prospected through the region for over twenty?five years. He is considered by the old-timers as one of the best and safest men to be placed in charge of a crew of men in the hills." True to form, Ranger Pulaski guided his crew through darkness and a raging inferno driven by hurricane-force winds, to the safety of the War Eagle Mine tunnel. In the years following the fire, he was lionized for his heroism, perhaps in part because he was everyone's vision of what a hero ought to took like. He bore a remarkable resemblance to the actor, Gregory Peck, stood six-foot three, had steel-blue eyes, and struck a commanding presence everywhere he went. When he retired from the U.S. Forest Service in 1930, a story in the Missoula, Montana Sunday Missoulian bore this headline: "Hero Of Great Fire Will Leave Service." Shortly after his retirement, he died from injuries suffered in a car accident. Excerpts from Thaddeus Roe's description of the wall of flames he faced in the fight to save Avery, Idaho. Roe was a member of the rescue team sent to Storm Creek to bring out the bodies of 29 men who stood their ground, rather than flee the raging fire. Later, a man who knew him described Roe's appearance at the rescue scene. "His outer garments had been burned from his body. His heavy woodman's boots had been burned through and only a remnant of a hat hung from his scorched head. His arms and legs were a mass of burns, the scars of which he will carry to his grave. He was thirty-two years old when he went into Avery six weeks ago. Today, he looks like a man of fifty, and gray has marked his hair." In order to save anything at all we had to begin firing the buildings on the outskirts of the town, and then the terrible work of forcing the backfire towards the big blaze began. I will never forget the sight An impassable wall of fire was eating its way down the hillside. Our backfire, which had assumed huge proportions, was creeping up towards it. In exactly four and one-half minutes after we started our fire, the two met. Never have I seen anything like it Plunging at each other like two living animals, the two met with a roar that must have been heard miles away. The tongues of fire seemed to leap up to heaven itself and after an instant's seething sank to nothingness. We had won, but the strain of those four and a half minutes had exhausted us and we sank down and lay there in the ashes babbling incoherent thanks to God. The rest of the world didn't know what we were going through. It couldn't, and that was the terrible part of it We might have been the only men in the world for all it mattered. Alone, we were left with nothing but our bare hands and the help of our Creator to bring us out alive. A description of the scene on Storm Creek, where 29 firefighters were burned to death, from Up the Swiftwater, by Sandra Crowell and David Asleson, published by the authors, 1980. The main part of the large crew headed for Avery around 6:30 that evening, the flames traveling so fast after them that at times trees above their heads were on fire. They were singed and burned, and one man's shoes had burned through when they arrived at Avery. They were the lucky ones. Pat Grogan and his followers were cremated within seconds after the fire struck them. Grogan and his dog stood their ground at the camp site and died; his watch stopped at 7:27 p.m. The remains of the others dotted the canyon for half a mile. The one the longest distance from the camp had added seven minutes to his life by running. His watch stopped at 7:34 p.m. Some had attempted to climb the canyon wall in their helpless flight Burned flesh, skulls and skeletons were all that was left of most of the men. A few were found with their faces turned grotesquely backward toward the oncoming fire. Even the silver found in their pockets was melted, along with their watches and pocketknives. David Bailey survived at Beauchamp's cave by diving into a creek instead of the cave. Here he describes what he saw. "It was while holding a covering over my head that I burned my hands. We were in the creek for about two hours, I believe, and we were all shaking from the cold as though we were suffering from the fever when we piled out It was pretty tough up on the summit without any covers and soaked to the skin. One of the boys contracted pneumonia." Bailey and the others who survived had their hair burned off, and seven comrades who fled into a cave were, in Bailey's words, "cooked alive." All of them tried to get at the very end of the small hole and they were piled up in an awful heap," he recalled. "It was impossible to take out their bodies, for. they would fall to pieces." Excerpts from chapter titled, ":A Ride Through He,:," describing one of three daring rescues involving trains that raced through blazing forests to rescue townspeople surrounded by fire. Bridges behind them were crackly with fire; way ahead another burst into flames. There was no way they could make it back to the St. Paul Tunnel or Falcon and Marshall. Tunnel 22 was closest, a short bore but their only hope. They opened the throttle wide - it was now or never. The train pushed through the first wave of fire, the varnish on the coach blistering in the intense heat Would they be able to make it through the second wave? They were blocked - the fire was too thick! They had to turn back The first furnace had expanded, and now the train could not get through it, either. They were caught between fires! Lieutenant Lewis in his report noted: 'The scenes of the fires, the dense smoke, the intense, blinding heat and the crackling flames were indescribable. The flames seemed to be over a mile and a half high. We traveled back and forth, attempting to get through at one end or another, but it was impossible. 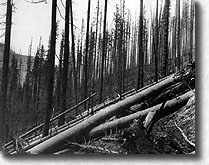 Progress was constantly impeded by landslides or rocks, or burned logs. Finally at 5:30 a.m. on Monday, August 22, the train made it back to Avery, It was their last chance. Orland Scott describes the scene around St. Maries, Idaho, the afternoon of August 24, 1910. The account is taken from a book he wrote titled Pioneer Days on the Shadowy St. Joe, published in 1967 by Caxton Printers, Caldwell, Idaho. Scott grew up on the St. Joe River, and lived for many years in St. Maries, a logging and farming community on the banks of the St. Joe. Reading his description of how panicked St. Maries residents reacted to the wall of flames they faced, it is easy to see why pioneers living in frontier timber towns feared forest fires more than anything else. In all directions there was nothing left but the burning stumps of once-beautiful trees; a downed monarch of the forest, fallen to the ground, fed the fire along its entire length. There were hot ash-heaps where trees had criss-crossed in failing and met hot destruction together. Appalling desolation everywhere.